Welcome to Lakeside Dental. We are committed to the practice of comfortable, caring, and excellent family dentistry. You have chosen a team dedicated to you and your family. We appreciate the trust you have placed in us, and we promise to provide you with state-of-the-art dental care. Our goal is to provide you with the highest quality, up-to-date care. Our mission is to provide you with a balanced and beautiful smile, while in a relaxed environment. Our facility (featured on the architects website) was designed specifically with the relaxation and comfort of our patients in mind. Private treatment rooms face Copper Creek Lake, so that you may relax with a beautiful view of the waves, trees, and wildlife. 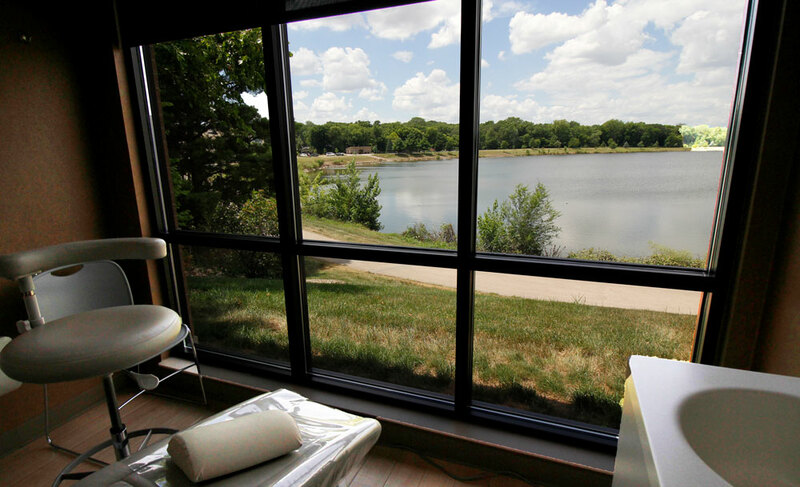 While in our dental office you can enjoy the view of Copper Creek Lake. Our examination process is thorough and complete. All findings and recommendations will be explained to you in a manner that is easy to understand. We want you to be completely comfortable with your care and encourage questions at any time. Convenient appointment times are available at any time, Monday through Thursday, 7:00 a.m. – 5:00 p.m. and Fridays 7:00 a.m. – 3:00 p.m. so that minimal school or work time is missed. We offer convenient payment options, so that you can have peace of mind as you obtain a healthy and beautiful smile. Karla will take care of the insurance paperwork and file your insurance for you. Our business is conveniently located at Copper Creek Lake with plenty of parking right at the door. We will welcome you to the office. We will have medical history and information forms for you to complete. These forms may also be obtained from this site if you wish to fill them out at home and bring them with you. Our hygienists may clean your teeth on the first visit, depending on the condition of your gums. We welcome everyone no matter how long it has been since you have seen a dentist. Everyday we care for people who are getting back on track with care. We will then visit with you about our financing options for your best peace of mind. Estimates for care will always be given to you in advance. We all look forward to meeting you and welcome your questions at any time. For further information and to schedule a new patient visit, please call Lakeside Dental today!